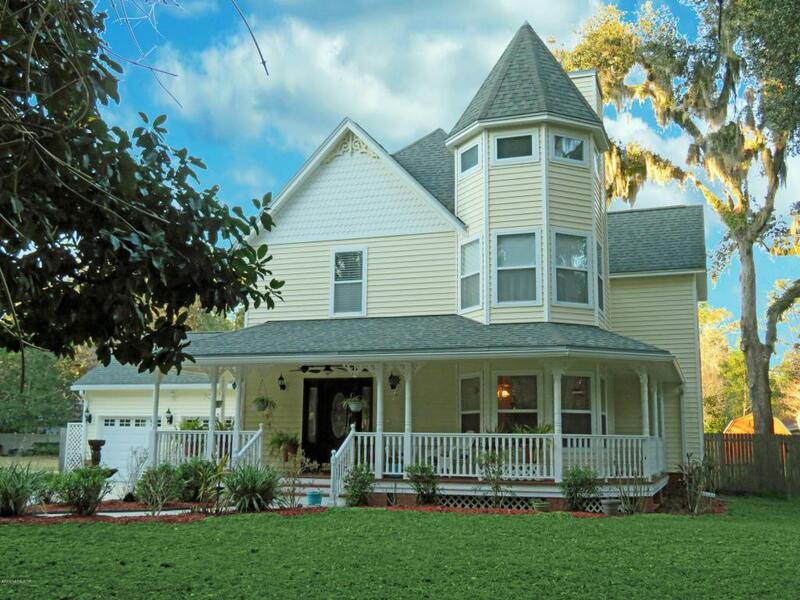 Welcome home to this wonderful custom 3 bedroom, 2 1/2 bath Victorian home with Florida/sun room on a .57 acre estate lot built in 2000 on a beautiful tree lined riverfront street in Fruit Cove. Interior features include wood floors, custom bead board, wainscoting, crown & chair rail moldings, ceramic tile, 2 fireplaces, upgraded lighting, inside laundry with washer & dryer, ceiling fans, digital thermostats, French doors, built in book shelves & entertainment center with 52'' flat screen TV, gas water heater, large walk in attic above 2nd floor, & fluted molding around doors. Kitchen has raised panel cherry cabinets with crown molding & glass front display cabinets, bay window in nook, sink with sprayer feature, crown molding, tin backsplash, ceramic tile floor & counter tops, dishwashgas top range, refrigerator, & built in microwave. Private owners suite has spiral staircase to widow watch, walk in closet, his & her walk in closet, ceramic tile, jetted garden tub/shower, custom marble vanity with framed mirror above. Exterior features include full vinyl exterior, wrap around front porch, glass door at entry, fountain, fenced front & rear yard, storage sheds, irrigation system & oversized 2 car garage with automatic opener, storage shelves, & attic stairs.Fantastic St Johns county location with no HOA or CDD fees is a great place to call home.